IODA s.r.l. – ophthalmic products and industrial lenses. – IODA is a production company: ophthalmic products and industrial lenses. IODA is an Italian company founded in 1977. Since then it has always worked in the optics production, making ophthalmic lenses, lenses for industrial applications or Led lenses for lighting. IODA is a company of engineers, whose knowledge and technology distinguish it in the production of lenses, which is our main business. Thanks to our flexible production, we can create lenses following our customers’ peculiar requirements. IODA designs and builds all its products in Italy. IODA s.r.l. works on customers’ specifications, giving support with system design and development, from sample phase to mass production. IODA s.r.l. makes use of the collaboration of the University of Padua, in particular works with the National Institute of Physics and the Department of Astronomy. The projects concern lenses for industrial applications (cameras, image projections, filters, mirrors and optical windows) and lighting projects. The lenses are made from a glass blank, included finished and semi-finished, most of the industrial lenses and moulds for resin lenses. 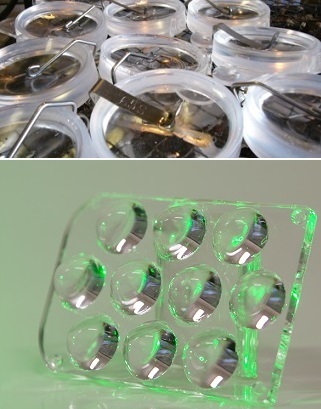 These lenses are obtained using a free-form machine. IODA can machine almost all the types of optical glasses, either for visible light, and for ultraviolet and infrared light; it has always availble a stock of optic glass and a direct contact with the most importtant optic glass suppliers. We can realize also a complex surface, such as progressive lenses or aspherical lenses. We can produce also lenses, whose profile is being developed by an algorithm, thanks to our Free Form production line. The control of the lens geometry is verified with interferometric and surface mapping systems, capable of highlighting differences between the virtual profile and the actual profile of the lens. Rav7 Ng e MR8 are resins used for the production of lenses and oftalmic semifinished. 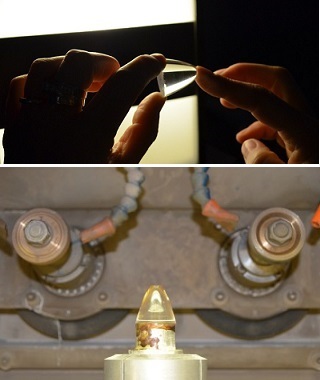 IODA production is wholly in the plant of Padova: from the glass moulds to the final tests. We can realize semifinished with 85 mm diameter and more than 20 mm width. REVO-01 is a polyurethanic resin, developed in collaboration with by ACOMON AG, used for the production of oftalmic lenses; later on it has been changed to create lenses used for lightning applications. This material provides great optical and mechanical characteristics; it allows to produce small batches at low costs in limited times.